Construction of the new NIFRS Logistics Support Centre on Boucher Crescent, Belfast starts this month following the appointment of Lowry Building & Civil Engineering as the principal contractor on the £7.8million project. 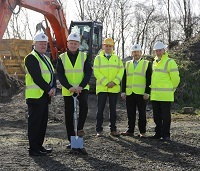 Michael Graham, Assistant Chief Fire & Rescue Officer, Director of Operational Support said – “We are delighted that work will start on site to construct our new Logistics Support Centre. It will bring our key operational support staff and services into one building and deliver real business improvement across the organisation. “The Logistics Support Centre will be the hub for the maintenance, servicing and repair of our fire appliances and operational equipment. Our current workshops at Central Fire Station in Belfast, NIFRS HQ in Lisburn and the equipment workshop in our Learning & Development Centre will all relocate. Our stores will all come under one roof which will promote greater control and allow for the effective provision of supplies to all parts of the organisation. In addition, our technical communication workshops and standby Regional Control Centre will also be based in the new Logistics Support Centre. There will be approximately 40 NIFRS staff working from our new bespoke facility and having our support services working side by side will greatly enhance efficiency. Building work commences in March 2017 with the Logistics Support Centre expected to open and be fully operational by Spring 2018. The Logistics Support Centre has been designed by HLM, who were also responsible for the award winning design of Omagh Community Fire Station & District Headquarters which opened in 2014.